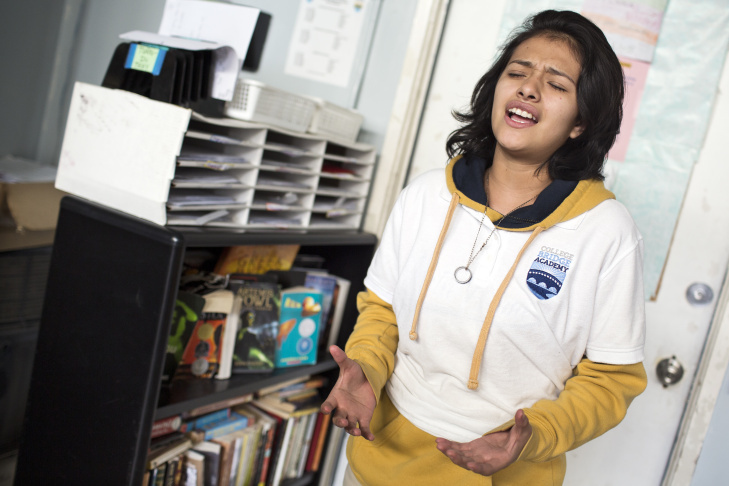 Sophomore Elvira Rodriguez recites "Royal Heart" by Andrea Gibson during a rehearsal for the semifinals and finals of the Get Lit Classic Slam poetry competition at College Bridge Academy in Watts on Tuesday afternoon, April 19, 2016. Rodriguez wrote an untitled response to Gibson's poem. Senior Winston Thomas III reads his poem, "The Laughing Pain," during a rehearsal for the semifinals and finals of the Get Lit Classic Slam poetry competition at College Bridge Academy in Watts on Tuesday afternoon, April 19, 2016. Senior Keevan Garraway listens as his classmate recites a poem during a rehearsal for the semifinals and finals of the Get Lit Classic Slam poetry competition at College Bridge Academy in Watts on Tuesday afternoon, April 19, 2016. The competition is the largest youth classic poetry festival in the world. 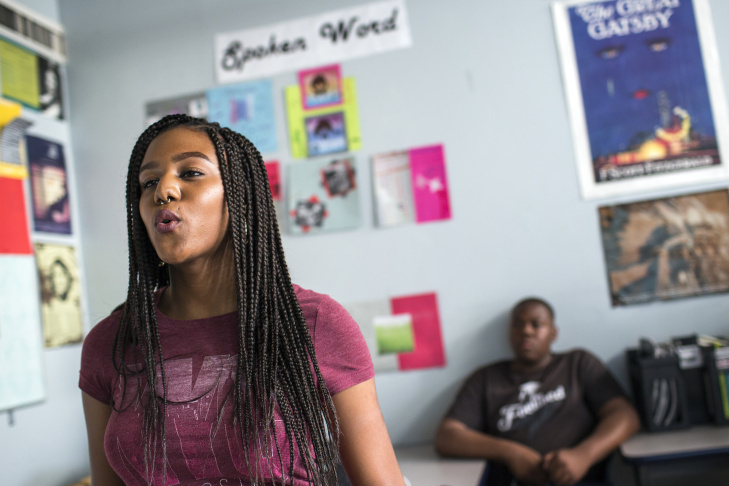 Senior Keithayonna Davis recites her poem, "Welcome Home," during a rehearsal for the semifinals and finals of the Get Lit Classic Slam poetry competition at College Bridge Academy in Watts on Tuesday afternoon, April 19, 2016. Davis' poem is a response to "Home" by Warsan Shire. College Bridge Academy students recite their Watts team chant after school on Tuesday afternoon, April 19, 2016. The chant is inspired by Jay Rock and Kendrick Lamar's song, "Hood Gone Love It." 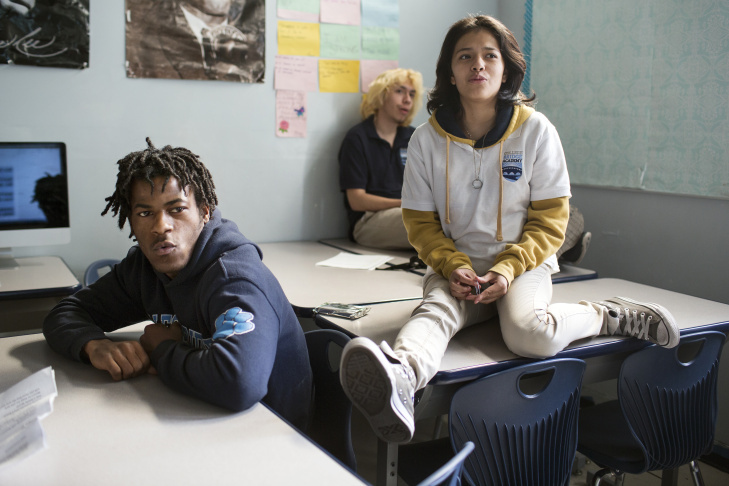 Senior Keevan Garraway,left, and sophomore Elvira Rodriguez recite their Watts team chant during a rehearsal for the semifinals and finals of the Get Lit Classic Slam poetry competition at College Bridge Academy on Tuesday afternoon, April 19, 2016. Senior Winston Thomas III listens to a classmate recite their poem during a rehearsal for the semifinals and finals of the Get Lit Classic Slam poetry competition at College Bridge Academy in Watts on Tuesday afternoon, April 19, 2016. The finals will take place at the Orpheum Theatre on April 30. Winston Thomas III stood at the front of the classroom, fidgeting a bit. "You're going to be standing up and you tell us your name and everything," Bridget Valles, coach of the spoken work poetry team advised. "And then, who are you talking to?" "When you say your poem?" Valles clarified. "To my son," he answered, with a smile. Thomas, a senior at College Bridge Academy in Watts, was about to recite "The Laughing Heart" by Charles Bukowski. "I say it to my son because if I ever had to die soon or before I could tell him something, I think that poem would be one thing I want to tell him," he explained. 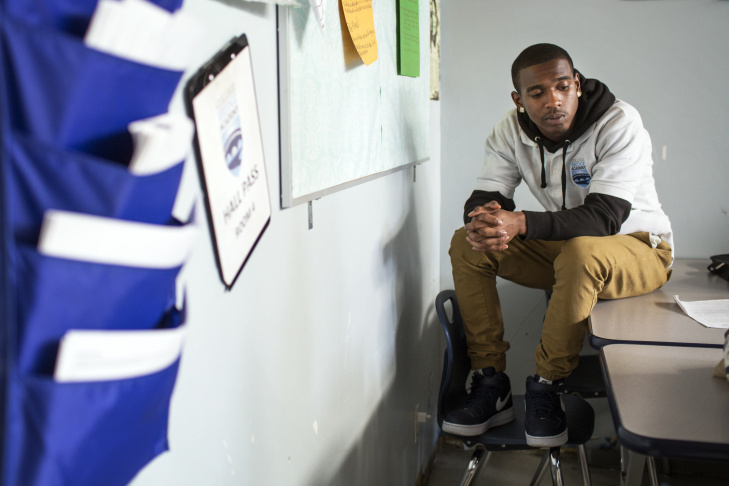 Thomas, 17, is a senior at College Bridge Academy in Watts, and one of six students on the Get Lit spoken word team. The mission of Get Lit is to use spoken word to increase literacy and transform lives. It was founded 10 years ago and about 50,000 kids have come through the program. Teens choose a classic poem that they connect with, study and memorize it. Then, they write their own response. The moment he touched my hands, I became a man. Growing up nearby in Compton, Thomas also seen a lot of people his age die. "I want to be able to share the stories of people whose story’s never gonna get told," he said. "It’s a lot of people from the bottom who have stories that should be on top." His high school is one of 50 that will be competing in the Get Lit Classic Slam – vying for just four team spots in a big event at the Orpheum Theatre in downtown L.A. on Saturday night. The slam poetry world has always been a safe space for teen angst, but at College Bridge, it's a safe space for much more. College Bridge Academy is a charter school specifically for students who have dropped out or had a hard time in traditional school settings. 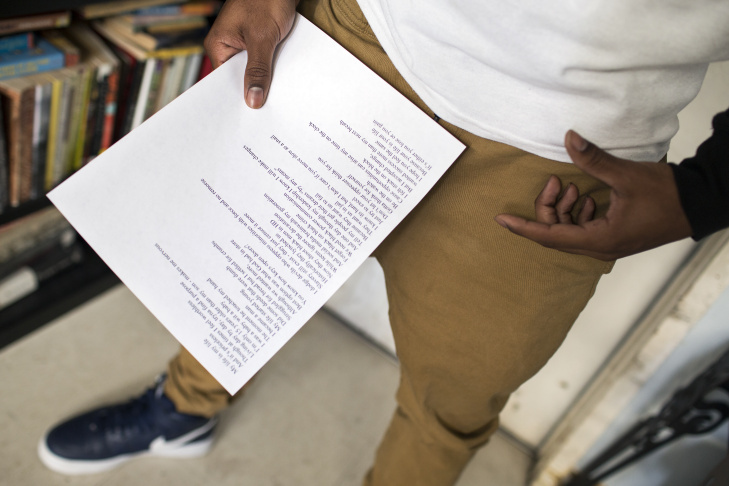 The poetry program has become a valued outlet for the many students who have witnessed gang violence, spent time in foster care or survived abuse. 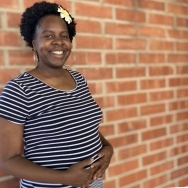 And in Watts, a neighborhood still struggling to recover from riots more than 50 years ago, Valles says kids have the chance to be modern-day griots, storytellers in their communities. "Like for a while there’s almost this disbelief." Get Lit has 75 schools – mostly in Southern California – that use their curriculum. Most of the time English and drama teachers incorporate it into their classes with occasional lessons or units. Teams have practice after school. But at College Bridge, Valles has expanded it into a semester-long class of its own – it’s all about analyzing poetry, hip hop and spoken word and writing new work. She’s been teaching it for more than three years and said that for many students it’s been transformative. 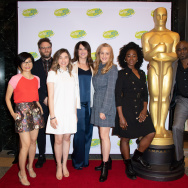 "They realize that their story is something that needs to be shared, that needs to be said out loud, and that, once they say that story out loud, truly changes not only them but the audience," Valles said. 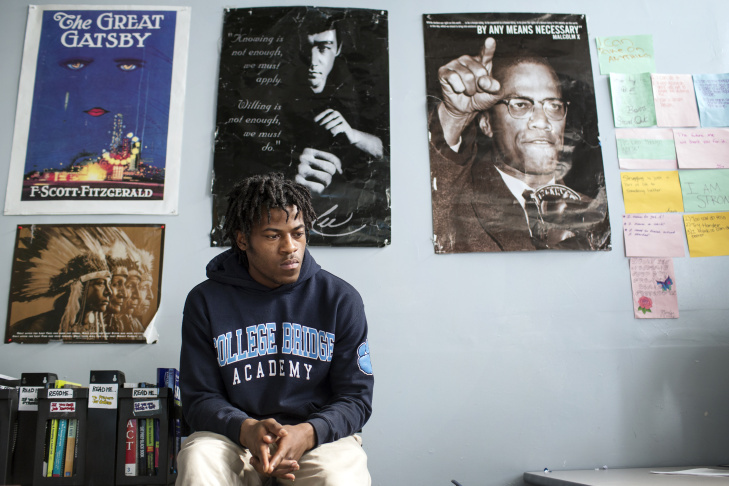 Valles says she can usually put her poets in two categories: Students like Winston, who feel passionate about writing to uplift and inspire others, and those who use poetry as a way to process trauma. Sophomore Elvira Rodriguez, 15, is in that latter category. The classic poem she’s reciting is "Royal Heart" by Andrea Gibson. The abuse she writes about happened ten years ago. But she didn’t tell anyone until this school year. "Instead of holding it in and being depressed all the time," Rodriguez said. "I decided to just put it in my poem and finally said it out loud." When she told Valles, the school informed her parents and her therapist. Students like Elvira receive weekly counseling sessions at school and there’s support for families. Valles says that for her students, poetry is also therapeutic. 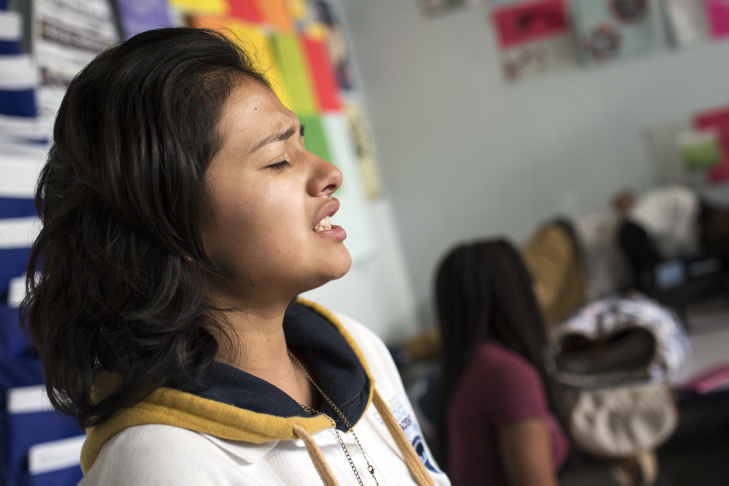 "I’m not saying once you tell your story in a poem, you’re magically healed," Valles said. "It doesn’t work that way but it does, with qualified mental health, it really helps the healing process because it turns it into an art and shows them they’re not alone." Spoken word has become a big part of the College Bridge culture. Valles holds a poetry club all year, but the Get Lit team is cemented in February. They practice twice a week, but in the weeks leading up to the competition, have been meeting daily – finessing their delivery and shaking off any nerves about performing. Being involved in the competition has opened doors for previous students. Three former team members there have gone on to be ambassadors with the program, competing in spoken word competitions around the country and performing on television and at The White House. For the past two years, the team has made it to the semifinals. They'll perform on Friday for a chance at just four team spots that will compete on stage at the Classic Slam. At practice last week, they worked to perfect a team chant that reflects the cultural tradition of storytelling in their neighborhood. 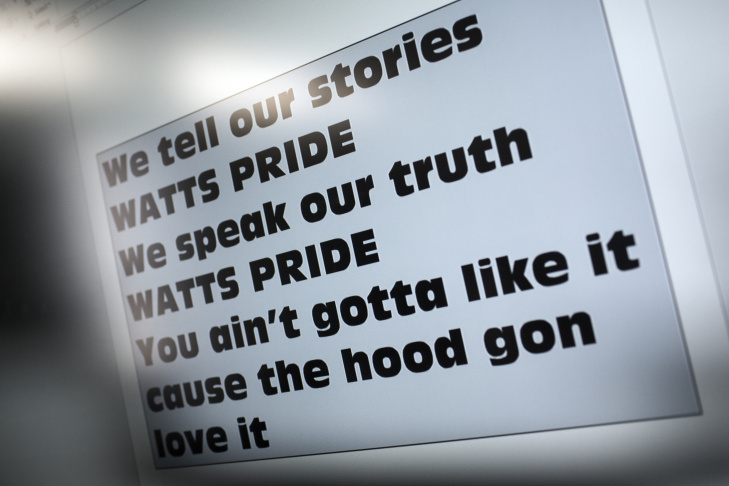 It's a call and response and borrows a refrain from a song by rapper Jay Rock, a Watts native. The 50th anniversary of the Watts riots inspire a "cathartic history lesson"